Home / Lakewood Ranch Plumber / Why Do Toilets Overflow? Why do toilets overflow? When people search the internet for Loveyourplumber.com, they find Wimpy’s website. This will get them to the Plumber in Sarasota that will find out why their toilet overflows. 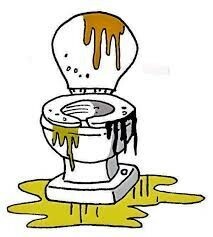 There are numerous reasons for toilets to overflow and what a mess it becomes when it does happen. So let me help you nip this problem in the bud. Below are some reasons why toilets overflow. 1) There is not enough water in the tank, to create the proper siphon action in the bowl. 2) The refill tube is not properly positioned in the overflow tube. This will cause the bowl not to fill. 3) The tank does not fill fast enough between flushes. 4) The trap way of the bowl is calcified and catching paper and causing bowl stoppages. 5) A guest using way to much paper. 6) A change in medication, creating hard stool. 7) A poorly designed toilet. Not all toilets are the same. Some flush a whole lot better than others. 8) Older homes with cast iron waste lines could be the cause due to rust, scale and sediment build up. 9) Roots can infiltrate the waste piping system, searching for water. 10) Newer homes will have pvc waste piping, but are still stopping up and causing the toilets to overflow. 11) We find the lack of the proper pitch or bellies in the pipe, causing paper to build up and toilets to overflow. 12) An extremely long run of waste piping, with very little fall. 13) Toilets today, are all water savers, this does not mean that they will carry the waste from point A to point B without a problem. If you are having are having problems with your toilets overflowing, call Wimpy’s Dependable Plumbing. We are Sarasota’s expert Plumbing Company, that will find the source of your toilets overflowing. We give estimates and second opinions. Log on today at Loveyourplumber.com and schedule an appointment on line. Or call 941-322-1911 to speak to the friendliest person on the phone, who can schedule one of our professional plumbers to take care of your toilet that is overflowing.